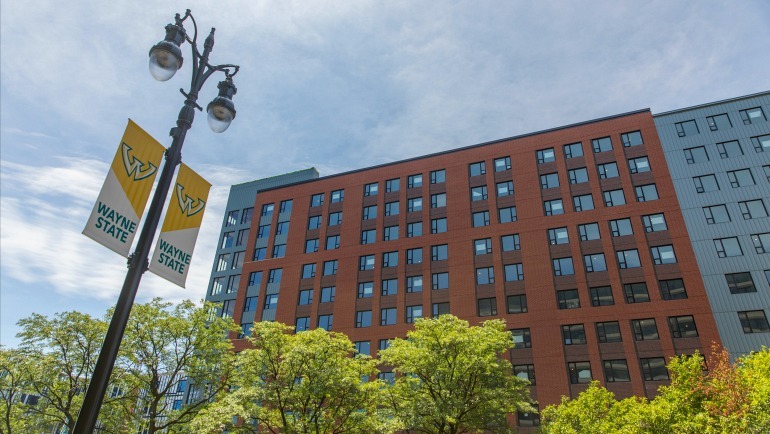 The first phase of Wayne State University’s Anthony Wayne Drive Apartments officially opens its doors to 407 student residents this weekend. The grand opening is part of “Move-in Days” — the university’s annual kick-off to the new academic year for freshmen and upperclassmen living on campus. President M. Roy Wilson and first lady Jacqueline Wilson will be on hand to welcome students and parents to the Anthony Wayne Drive Apartments. In addition, the Wilsons will hand out ice cream to students and engage with families as students move into Wayne State’s newest apartment complex. Reporters are invited to tour the brand-new building and interview students and their families as they move into Midtown’s newest residence hall. Anthony Wayne Drive Apartments are located on the west side of Anthony Wayne Drive between Kirby Street and Warren Avenue. Move-in Days for all students will also take place at Ghafari and Atchinson Residence Halls, on the east side of Anthony Wayne Drive, and the Towers Residential Suites, 655 W. Kirby. The first phase of the Anthony Wayne Drive Apartments is the center 11-story building with room for 407 residents. The second phase will open in June 2019, adding an additional 434 beds. The Anthony Wayne Drive Apartments feature studio, one-bedroom, two-bedroom and four-bedroom units. The new apartments are furnished units, including a full kitchen, common space and individual bedrooms with full-size beds. Each floor has multiple lounge areas, including study space and hangout areas. There are two large community rooms on the first floor. The first floor will be home to retail space that include 1000 Degrees Pizza, a fast-casual franchise operation with locations across the U.S.; a Tubby's sub chain location; and a Leo's Coney Island. More to come as vendors are secured. The Anthony Wayne Drive Apartments will be reserved for students of sophomore standing or above. There will be three courtyard areas. One will be open and the other two will be fenced in. The new Campus Health Center will be located on the first floor.